Americas gateway to the universe. Leading the world in preparing and launching missions to Earth and beyond. 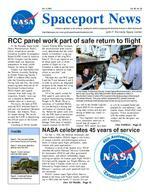 Oct. 3, 2003John F. Kennedy Space Center Spaceport Newshttp://www-pao.ksc.nasa.gov/kscpao/snews/snewstoc.htmVol. 42, No. 20(See PANELS, Page 2) Inside Page 8 Combined Federal Campaign now in full swing Page 3 Intercenter Walk/Run attracts more than 200 Page 2 The Kennedy Update from Center Director Jim Kennedy Page 6 Culvert removal improves water qualityNASA celebrates 45 years of service(See 45 YEARS, Page 4) On Oct. 1, 1958, the National Aeronautics and Space Administration (NASA) began a rich history of unique scientific and technological achievements in human space flight, aeronautics, space science and space applications. Formed as a result of the Sputnik crisis, NASA inherited the earlier National Advisory Committee for Aeronautics (NACA) and other government organizations, and almost immediately began working on options for human space flight. NASAs first high profile program was Project Mercury, an effort to learn if humans could survive in space, followed by Project Gemini, which built upon Mercurys successes and used spacecraft built for two astronauts. NASAs human space flight efforts then extended to the moon with Project Apollo, culminating in 1969 when the Apollo 11 mission first putRCC panel work part of safe return to flightAs the Kennedy Space Center Debris Reconstruction Teams efforts wound down and the Columbia Accident Investigation Board (CAIB) issued its report to NASA, Congress and the public, another team was beginning preparations to ready orbiter Atlantis for return to flight. Atlantis was transferred from the Vehicle Assembly Building to Orbiter Processing Facility 1 (OPF 1) in March 2003 shortly after the Columbia accident. During June and July, the orbiter processing team removed all 44 Reinforced Carbon-Carbon (RCC) Panels and support structure from both wings for inspection. Atlantis nose cap was evaluated to determine whether removal is necessary. Previously, the team at KSC removed RCC left-hand Panel 8 and sent it to Southwest Research Institute, San Antonio, Texas, for impact testing. The results assisted the CAIB in determining the official cause of the Columbia accident. According to NASA Shuttle Launch Director Mike Leinbach, the reconstruction team conclusively determined that the initial breach in Columbias wing was in the bottom of left wing RCC Panel 8. So it was logical to use an actual panel with a similar number of flights on it as Columbia in order to get the most representative reaction to foam strikes as possible, said Leinbach. The team also sent RCC panel 9 and the T-seal between 8 and 9 in order to achieve an integrated response to the impact test using all flight assets in the area in question. All of the panels, except for RCC panel 8, were sent to the original manufacturing company, Vought in Ft. Worth, Texas, a subsidiary of Lockheed Martin, for non-destructive testing and verification of structural integrity. Before the panels were sent out, the KSC team of technicians and engineers inspected each piece to identify any defects or damage. Each piece of metallic support structure for the RCC was sent to the Shuttle Logistics Depot (NSLD) for inspection using eddy current and dye pen testing to detect any cracks or problems. Our engineers have taken every precaution necessary to ensure that all aspects of Atlantis RCC panels have been or will be evaluated tested and prepped for reinstallation, said Charlie Abner, NASA-KSC chief engineer. Close coordination with the orbiter project, the vendors and the designers was mandatory.In the Orbiter Processing Facility, United Space Alliance workers, from center, left to right, Saul Ngy, Jerry Belt and Mike Hyatt, prepare to attach a Reinforced Carbon-Carbon (RCC) panel to the leading edge of the wing of the orbiter Atlantis. The gray carbon composite RCC panels have the strength to withstand the aerodynamic forces during launch and reentry. SPACEPORT NEWS Oct. 3, 2003 Page 2 Awards The Kennedy UpdateJim Kennedy Center Director Its never easy to begin a column with sad news, but its with a heavy heart I report, in case you didnt hear, that NASA and KSC lost one of its finest people with the passing of Michael Demski, Sept. 20. Only 35, Mike was an engineer with the Space Station and Payload Processing Directorate. His passing was unexpected, and I know you join me in sending thoughts and prayers to his wife Deborah, his young family of Stephanie, Catherine, Brian and Emily and the UB family that loved and respected Mike a great deal. Mike was a true patriot, serving in the Air Force before joining NASA, and was known by his friends and co-workers for his kindness, huge heart and unique sense of humor which always made people laugh. May we all be so lucky to be remembered in this way. Mike is irreplaceable and his family and friends will never forget him. While it isnt easy to continue this column, I will do my best knowing that Mike would want us all to continue to do great work for NASA and our nation. Through Oct. 15, NASA is joining with other agencies and organizations throughout the United States in celebrating Hispanic Heritage Month with many events and commemorations. The theme for this years 34th observance is Hispanic Americans: Honoring Our Past, Surpassing Our Present, and Leading Our Future. I hope everyone was able to see the note sent by Sean OKeefe concerning NASAs recognition of Hispanic Heritage Month. As an Agency with people from all walks of life, I believe its important to recognize the contributions of everyone who made a difference in building NASA into the greatest space Agency in the world. I look forward to this years Combined Federal Campaign (CFC) lead by Susan Kroskey and her team of volunteers. There is a news article in this issue with details, so Im just asking everyone to look into your hearts to help others who may not be as fortunate as we. As we learned with the Columbia tragedy, many CFC beneficiaries stood by our side in East Texas. They also directly helped many of the NASA and contractor people carrying out the tough search for debris. Back here, they work with some of our employees on an almost daily basis to help them through difficult periods in their lives. Many of these organizations literally count on the annual CFC for their very survival. Thanks again for your consideration Its hard to believe we turned the calendar this week to Oct. 1 and celebrated NASAs 45thanniversary. I have enjoyed being part of this TEAM for 25 of its 45 years and look forward to many more, serving with you, toward building the next 45 years. Just imagine what the future might hold for us if we work together as a team. On Sept. 10-12, the KSC leadership team held a three-day offsite in Vero Beach to begin laying a path for the future of KSC. As Woodrow Whitlow said during the all hands, it was inspiring to see the leaders of the directorates come together and work as a team for the betterment of the center and NASA. While this was just a start, there are items I will periodically address since well be asking for your input along the way. The first item deals with future work at the Center. Along with our current workload, NASA has asked KSC to begin the process to provide manpower and resources toward such important projects as Return to Flight, the Orbital Space Plane, Expendable Launch Vehicles and the NASA Engineering and Safety Center. Some of this work requires full-time people working in new areas while different aspects of work need people to support these new programs from their current jobs. These are opportunities for people to expand their professional horizons and take on new challenges. Working with Human Resources, each directorate has information on these initiatives. If you are a hard-charging person looking for a new challenge and wish to participate, make sure your supervisor is aware as the process unfolds. Finally, remember Spaceport Super Safety and Health Day is Oct. 15, and many great activities are planned. Its a great time for everyone to take a step back and examine the way were doing business, ensuring its done as safely as possible. Woodrow, Jim Hattaway and I will be out and about that day participating in all the events. We look forward to seeing you on this special day. Thanks for your time and have a great week! The nose cap, chin panel, forward External Tank (ET) attach plate, wing leading edge, and all RCC components will be in excellent condition for return to flight, said Abner The KSC team repaired the support structures as necessary and then reassembled them to original specifications. A new RCC panel 8 is being manufactured and will be sent to KSC for installation. According to Scott Thurston, Atlantis vehicle manager, the work has been performed thoroughly. In addition, the processing team is inspecting critical wiring in the crew module and select structural areas throughout the orbiter. KSCs Hypergol Maintenance Facility replaced all 14 primary and 2 vernier Forward Reaction Control System Thrusters, and the 12 primary and two vernier each for left and righthand Orbital Manuevering System pod thrusters in Atlantis. The entire orbiter, inside and out, is being inspected, with parts removed and repaired, then reinstalled according to specifications. The KSC team is doing everything it can to help the Shuttle return to flight as safe as possible, said Thurston.PANELS . .(Continued from Page 1)Gate 2C on Kennedy Parkway North was recently removed after the new security gates were activated Aug. 1. SPACEPORT NEWS Page 3 Oct. 3, 2003This years Intercenter Walk/Run at the Shuttle Landing Facility had 203 people participate under cloudy skies. Spaceport employees enjoyed getting cooled off, as well as free massages and a catered dinner from Kelseys. The winners (female and male) included: 2-mile walk : first  Karen Cauffman and Dave Hillebrandt; second  Ivette Rivera and Vince Elentri; third  Janet Barfus and Glenn Washington; random drawing  Patricia Sweetman and Deborah Blankenship 2-mile run : first  Kristin Kelley and Nathaniel Mortimer; second  Diana Kniffen and Roosevelt Turner II; third  Darcie Powell and Felix Soto-Toro 5k run : first  Carol Ball and Pete Colangelo; second  Sasha Rodriguez and Dean Kunz; third  Lora Marcoccia and Bob Harmon; random drawing  Danielle Ford and Cathy Dibiase 10k run : first  Donna Rouzan-Wheeldon and Frank Kapr; second  Kim Ballard and Chris Hess; third  Deborah Crane and Sean Black; random drawing  Janet LetchworthIntercenter Walk/Run attracts more than 200Above, participants listened to how the course at the Shuttle Landing Facility was laid out. At left, runners leave the starting line. At right, the group enjoyed a catered dinner from Kelseys after the event.Managing human capital needs to be a priority government wide, but especially for NASA if it wants to attract and retain the best and brightest scientists and engineers to accomplish its core work, according to Daniel Mangieri, KSC lead human resources specialist. When President Bush issued the Presidents Management Agenda (PMA) in FY2002, he mapped out a strategy for improving the management and performance of the federal government, making it more citizen-centered and resultsoriented, said Mangieri. One of the first major initiatives he outlined in the PMA was Strategic Management of Human Capital. At the same time, there was a growing focus on human capital issues from a number of other outside influences, including Congress.Human capital initiative helps recruit skilled workersThe PMA, coupled with the realization of a shrinking pipeline of scientists and engineers, an increasing competition for technical skills and a lack of diverse applicants, prompted the formation of an official NASA Strategic Human Capital Plan. The plan comprises four focus pillars: strategic alignment, strategic competencies, learning, and performance culture. The foundation for the pillars is leadership. Also, prior to the plans implementation, Kennedy Space Center was already meeting some goals by enhancing recruitment efforts, increasing technology-based training opportunities and establishing undergraduate student research programs. To ensure all levels of employees understand human capital, the Workforce and Diversity Management (BA) team offered information sessions supporting the plans inauguration. Since July 30, a senior management briefing has been held, and most NASA employees have received a human capital brochure or e-mail and newsletter messages. In addition, directorates were given Human Capital Plan and Implementation Plan booklets. The Headquarters, Space Station Processing Facility and Launch Control Center cafeterias were home to human resources meetings in August and September. These events attracted more than 400 personnel. Furthermore, the BA web site offers information at http://ba.ksc.nasa.gov While these efforts proved effective, BA intends to continuously improve the Centers approach by enhancing the ability to work together as One NASA, enabling effective mission performance and ensuring human resources are well managed and used wisely. The Human Capital Plan is a rare opportunity to develop and implement a strategic approach to enhancing the asset we are most likely to take for granted people, said BA Director Richard Arbuthnot. The team that develops approaches to some of our nations greatest technical challenges is a very dynamic group, and is far too valuable to overlook. With the plan we can focus on where we are now, where we need to be in the future and how best to get there. It gives us a framework to acquire, enhance or retain skills that are often hard to find. We want to remain the best in the world, not only at what we do, but what we can do. Our Human Capital Plan will be one of the most valuable tools to get where NASA wants to go, said Arbuthnot. Page 4 SPACEPORT NEWS Oct. 3, 2003 Happy 45th anniversary NASA--1958-200345 YEARS...(Continued from Page 1)humans on the lunar surface. After the Skylab and ApolloSoyuz test projects of the early and mid-1970s, NASAs human space flight efforts again resumed in 1981, with the Space Shuttle program that continues today to help build the International Space Station. Kennedy Space Center has been an integral part of the 45year history. Its origin got started on Aug. 24, 1961, when NASA announced its intent to expand the Cape Canaveral facilities for manned lunar flight, and other missions requiring advanced Saturn and Nova boosters, by acquiring 80,000 acres of land north and west of the Air Force Missile Test Center facilities at the Cape. Construction of the Vehicle Assembly Building began in July 1963, and it was substantially completed early in 1966. On Nov. 29, 1963, President Lyndon Johnson renamed both the Launch Operations Center and the Cape Canaveral Auxiliary Air Force Station to the John F. Kennedy Space Center seven days after the president was assassinated. NASA Administrator James Webb officially issued a similar order changing the name of NASAs facility on Dec. 20, 1963. Building on its NACA roots, NASA has continued to conduct many types of cutting-edge aeronautics research on aerodynamics, wind shear, and other important topics using wind tunnels, flight testing, and computer simulations. NASAs highly successful X-15 program involved a rocket-powered airplane that flew above the atmosphere and then glided back to Earth unpowered, providing Shuttle designers with much useful data. Additionally, NASA has launched a number of significant scientific probes such as the Pioneer and Voyager spacecraft that have explored the moon, theAbove and clockwise: Apollo 11 astronauts return from the moon. Next, the Hubble Space Telescope sits in the Space Shuttle cargo bay. Below, Astronaut James H. Newman wraps up extravehicular activity on the International Space Station. Bottom right, a mockup Mars Exploration Rover.planets, and other areas of our solar system. NASA has sent several spacecraft to investigate Mars including the Viking and Mars Exploration Rovers. The Hubble Space Telescope and other space science spacecraft have enabled scientists to make a number of significant astronomical discoveries about our universe. The Agency has also done pioneering work in space applications satellites. NASA has helped bring about new generations of communications satellites such as the Echo, Telstar, and Syncom satellites. NASA technology has also resulted in numerous spin-offs in wide-ranging scientific, technical and commercial fields. Expo 2003, sponsored by NASA-KSC Small Business Council, 45th Space Wing and the Canaveral Port Authority, will feature more than 150 exhibitors who can help businesses better understand how to contract with the government. The event will also help government purchasing agents learn about what local and national businesses have to offer. The Expo will take place Tuesday, Oct. 21 from 9 a.m. to 3 p.m. at Cruise Terminal 4 in Port Canaveral. All the exhibition space has been reserved, and reservations are currently being taken for next years event.Expo 2003 highlights contracting opportunitiesAdmission is free and open to the public. Exhibitors will offer a variety of products and services, including computer technology, communication equipment and services, construction, and safety enhancement. Radio station WMEL AM-920 will broadcast live from the Expo and has scheduled interviews with several leaders in the space industry, including a representative from NASA Headquarters in Washington, D.C. As a co-sponsor, the KSC Small Business Council helps businesses learn how to navigate in the world of government contracting. Visit http://expo2003.ksc.nasa.gov for more information. Oct. 3, 2003 SPACEPORT NEWS Page 6After many months of investigating, testing and identifying more than 83,000 pieces of Columbia debris inside the reconstruction hangar, KSC Columbia Reconstruction Team workers readied each piece for transfer to permanent storage. According to Scott Thurston, NASA-KSCs Columbia Preservation Team lead, nearly 7,000 square feet of space was set aside for debris storage, including a separate room for the crew module. The idea for permanent storage of Columbia at KSC came from the reconstruction team, and then Mike Leinbach, NASA Shuttle launch Director. Steve Altemus, NASA reconstruction director, pushed the idea forward, said Thurston. The idea took hold locally and then was slowly proposed to all levels of NASA management for their reaction or suggestions, said Leinbach. In time, everyone was on-board with the concept. We will learn a great deal from the debris, and this will be a lasting legacy for Columbia and her final crew. The first pieces of Columbia debris were transported to the Vehicle Assembly Building (VAB) Sept. 15 for permanent storage on the 16th floor of Tower A. The storage area also featuresColumbia debris transferred to VABa display area and includes all of the memorial banners, posters, cards and other memorabilia displayed in the hangar during reconstruction efforts. There are no plans to make the debris available for public viewing. The process to get the debris ready for permanent storage included inventorying, tagging and packaging the debris in a way so that specific pieces could be easily accessed as requests come in from the scientific community. The Shuttle Program has approved Columbia debris being used for research and education, Thurston remarked. Now we will take the requests to NASA Headquarters for approval. Transfer of all the debris was completed by the end of September. In addition to Columbia debris, the payload debris will also be stored in the VAB. Some of the payload debris was loaned out to the payload developers and primary investigators for study, but returned to KSC for storage. According to Thurston, a process to permanently transfer payload owners their material on request is in the planning stages. The decision to store the debris in a place where it would be accessible was, at first, a response to the strong emotional impact the debris had on people, said Altemus. But as we progressed with the investigation, it became apparent that there were some very interesting phenomenon in this debris that deserved to be studied to help us better understand hypersonic reentry in applications for future vehicle development. Also, there is a wealth of science to be gleaned from the debris that can help advance material science research and accident investigation techniques. Although the mood was somber as workers packaged the pieces and the first truck arrived to transfer Columbia to its final resting place, there was also a feeling of anticipation as workers look forward to return to flight. The Shuttle is an incredible machine. Its still a marvel. No one else has one like it, said Thurston. A dedication ceremony is being planned once all the Columbia debris is placed in the permanent storage area. Look for more details in a future issue of Spaceport News.The first pieces of Columbia debris were transported to the Vehicle Assembly Building (VAB) Sept. 15 for permanent storage on the 16th floor of Tower A. In addition to Columbia debris, the payload debris will also be stored there.Beginning in June 2003, various NASA and contractor groups started work on removing a culvert located behind Launch Complex 39A (LC-39A) because of environmental concerns. The impoundments were built in the 1950s to control the breeding of salt marsh mosquitoes. Impounding these salt marsh areas created enclosed waters, with the only connection to the lagoon being through culverts placed in the dikes for water control purposes. Fish use these culverts to enter and exit these impoundments. The collapse of a culvert at LC-39A completely isolated a 225-acre impoundment from the Banana River, trapping thousands of redfish, snook and other sport fish within the impoundment. The problem became critical in the summer months when air and water temperatures rose. As the water temperature rises, the dissolved oxygen in the impounded water drops. Several of the fish species in the impoundment, particularly the redfish, are easily impacted by low dissolved oxygen. Also, since there was no flushing of the impoundment through the culvert as wind driven tides allow, the water quality inside the impoundment became critical. The quick work of Yang Roads and Grounds resolved what could have been an environmental concern.Culvert removal improves water qualityThis culvert located behind Launch Complex 39A was removed to restore water flow to an isolated 225-acre impoundment. The impoundments were built in the 1950s to control the breeding of salt marsh mosquitoes.